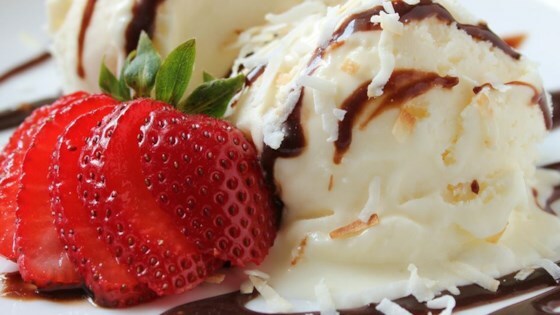 "Creamy ice cream with a rich coconut flavor. A sweet treat that any coconut lover would enjoy." Combine the milk and cream of coconut in the container of a food processor or blender, and mix thoroughly. Stir in cream and flaked coconut. Pour into the container of an ice cream maker, and freeze according to the manufacturer's instructions. Note: Do not confuse sweetened cream of coconut-used in this recipe-with unsweetened coconut milk or cream. The sweetness in this recipe comes from the cream of coconut. This recipe is off the hook good! I served it to dinner guests with a wedge of grilled fresh pineapple, and it was a big hit. The great thing is it looks very fancy, but is very easy! i toasted the coconut and blended it up in the blender with the milk and cream of coconut to chop it up a bit. it turned out amazing! next time im going to add pineapple...mmmm...so good!